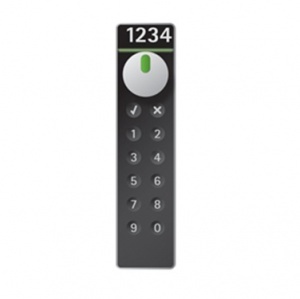 Electronic PIN code locking system with RFID Programming and RFID Master key function. For lockers, safe-deposit boxes and functional furniture, with wear resistant capacitive key pad (touch-sensor). Rectangular lever operates the locking cam with many possibilities to individualise locker numbers, writing, or logo by exchangeable plates. Suitable for locker doors originally prepared for cylinder lever locks. Adapts to both right and left handed locker doors in four different directions. Lock is released after entering a 4 digit code; 99 different user codes including time limits per lock.